As part of our Learning and Engagement activity, we present a number of year-round creative projects that engage children who are in school years up to Primary 7 with music, theatre, opera, visual art, literacy, and health and wellbeing. Download our Primary Schools 2019 Summer Programme. 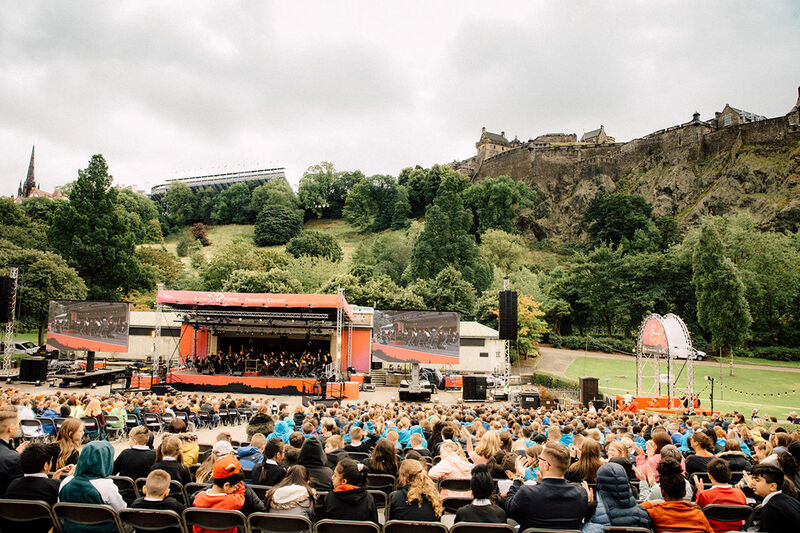 The International Festival and Scottish Chamber Orchestra invite Primary 7 classes to this year’s Virgin Money Schools Concert, our annual open-air classical music concert. Once again, we will be taking over the Ross Bandstand in Princes Street Gardens to present the full Scottish Chamber Orchestra performing the repertoire from this year’s Virgin Money Fireworks Concert. We are pleased to welcome back presenter Rachel Leach to guide us through this year’s magical programme including Dukas’ The Sorcerer’s Apprentice and Berlioz’s Symphonie fantastique, helping to support pupils’ understanding and appreciation of classical music. The concert is exclusively for P7 pupils and will take place on Monday 26 August at 1.30pm at the Ross Bandstand in Princes Street Gardens lasting around 45 minutes. Transport support to and from the Gardens is also available. New for 2019, we are also delighted to offer any teachers booked for the Schools Concert the opportunity to attend an interactive teacher’s CPD on Friday 14 June with Rachel Leach. Rachel will take you through simple and engaging musical warm ups and activities based on the music from the concert, and provide you with practical resources and ideas to take back to the classroom. All welcome, irrespective of musical experience or confidence! Places can be booked when booking for the Schools Concert. To book your class for this year’s Virgin Money Schools Concert please complete our online booking form. Our 2018 VMSC Schools Resource connected to Holst’s The Planets can be found here. Design a poster for this year’s fireworks extravaganza! Are you a fantastic artist? Do you enjoy painting, drawing and colouring? Can you bring to life the magic of fireworks? 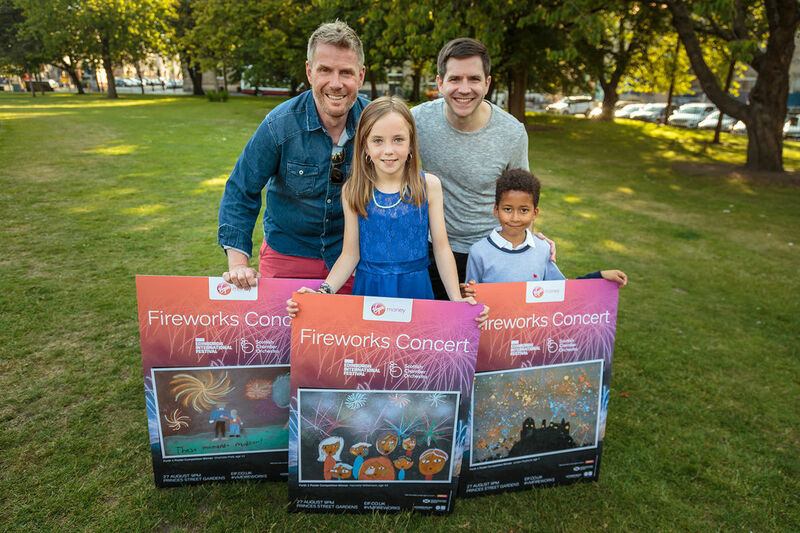 We need your help to create the poster for this year’s Virgin Money Fireworks Concert! The Edinburgh International Festival is delighted to launch our annual poster competition for primary school children from Edinburgh, the Lothians and Fife. We are looking for the best and the brightest creations, bringing to life the International Festival’s spectacular Virgin Money Fireworks Concert, with partners Virgin Money, the Scottish Chamber Orchestra and Forth 1. The competition is open to individuals, families and primary school classes to enter. To enter on behalf of a Primary School full information can be found here. Download the Primary Schools Application Form. This year, theatre company 1927 bring their brand-new production Roots to the International Festival which will explore a collection of folk tales from around the globe, all told imaginatively through their combination of movement, music and animation. 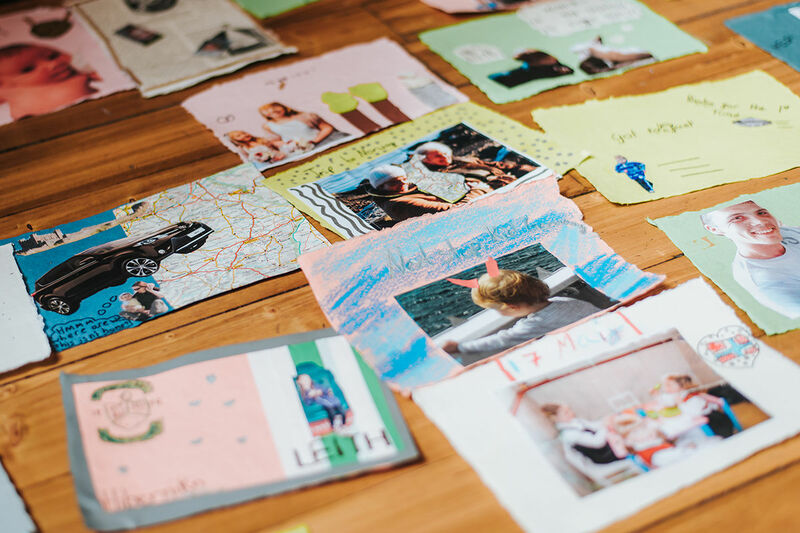 My Festival: My Story is a project for Primary 6 pupils that will explore what it takes to create stories and folktales and bring these stories visually to life. Delivered in two halves over May and June, part one will see artists visit schools to present a story creation workshop, developing brand-new stories with each class and making recording of these being told by pupils. The stories will then be swapped with the stories from another participating Edinburgh Primary. Part two will see our artists return, this time to explore how pupils might visually bring to life the tales they have received from another set of Primary 6 pupils. Animation, story books, puppets… the options are endless. The results will all be documented and shared with the each school to see how they each chose to bring the stories to life. During the International Festival, the results of the workshops will be displayed and presented at the Church Hill Theatre where 1927 will perform Roots from 9 to 15 August. My Festival will support teaching in Expressive Arts, Language, Creativity and Literacy with focus on challenge and enjoyment, personalisation and choice. If you would be interested in signing up your Primary 6 class/es for My Festival, please complete this online form. Bringing the glamour of the movies to the schools of Edinburgh. In celebration of this year’s Aberdeen Standard Investments Opening Event: LA Phil at Tynecastle, the International Festival is working with local schools around Tynecastle Park to present a workshop that explores orchestras and the work of the LA Phil, film scores and their importance to cinema, and a celebration of Hollywood, all culminating in each pupil creating their own star for a Walk of Fame. Look out for updates on this project coming soon…. The International Festival’s flagship classical music project. The Art of Listening is a music-based project for Primary 7 pupils introducing them to the International Festival through song and live performance. The two-hour workshop takes place in The Hub, with transport provided to all schools attending. Our team of artists present an engaging workshop that encourages pupils to increase their understanding of music and the role they play as listeners. Attendees are presented with an exploration of what we can hear when we listen to music, and how through a deeper understanding of this, we can engage our imaginations and develop stronger listening skills. Through live performance, practical exercises and an awareness of the skills of voice and instrument, pupils are presented the opportunity to creatively provide their response to music stimuli. This year has seen over 50 workshops take place, engaging over 1500 pupils. Applications for next year’s Art of Listening workshops will open again in Autumn 2019. Soul Boxes was a visual arts project that worked with pupils in their final year of Primary school, as they move towards Secondary education, exploring how art can be used to understand who we are, and the experiences that shape our lives. Over two workshops, pupils created their own box of collage memories which they can keep adding to as they move through their own education pathway. 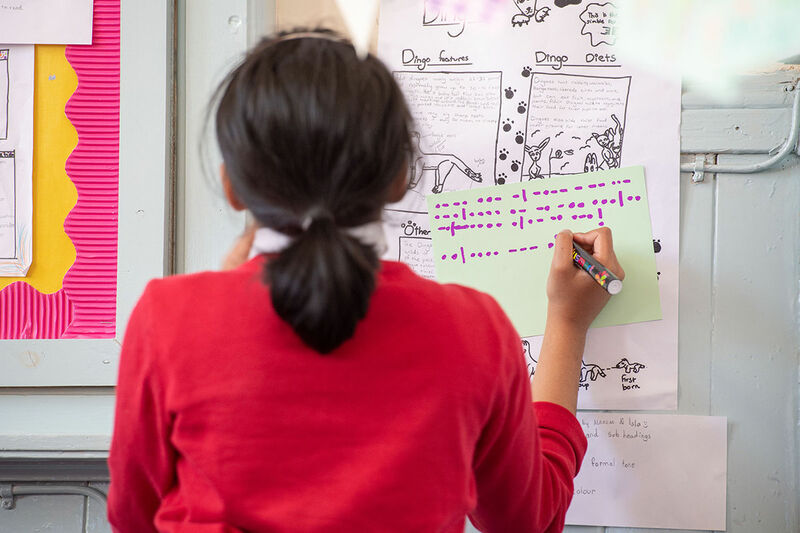 In celebration of the 2018 Aberdeen Standard Investments Opening Event: Five Telegrams and in partnership with 14-18 NOW, this project for Primary 6 pupils explored the themes of the work created by Anna Meredith and 59 Productions including visual musical scores, code-breaking and the history of telegrams. The workshop culminated in each pupil creating their own telegram which was then passed onto another participating pupil in Edinburgh. Five telegrams were also selected to be turned into postcards which were distributed during the International Festival.